The Aven 17010 is our favorite choice. This device is fantastic for clamping onto circuit boards for de-soldering/soldering and more. It can accommodate PCB up to 198mm wide and 4mm thick, which should provide you ample ability to clamp most boards. However, if you require a device to clamp bigger boards you’ll need to look for larger capacity. The feet have rubber mounts to keep the device from slipping while you’re working and to provide great stability. Another key factor with this model is that is can rotate the board a full 360 degrees, and stay in place. This feature allows for easy access from any difficult angle. Overall this is a great choice for those of you interested in soldering or other precision work. The Circuit Board Holder is basically a device designed to grip circuits while you work on them. 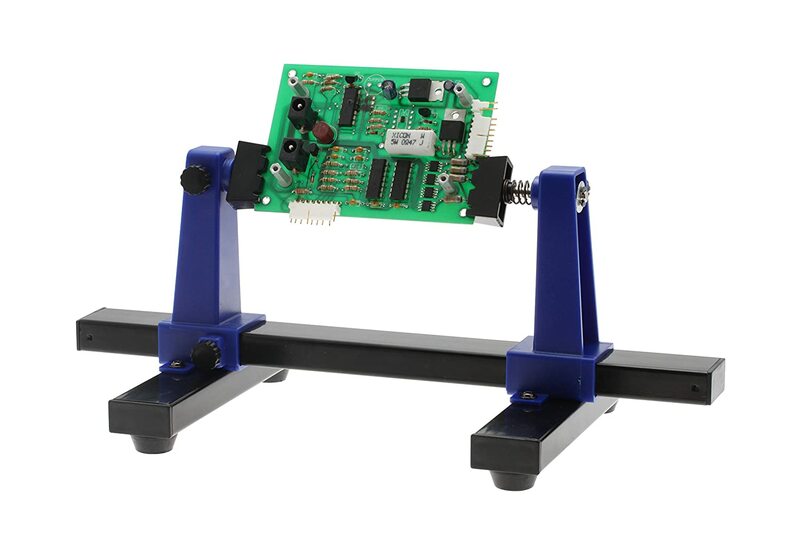 The device consists of 2 grips either end of the stand, which can be adjusted to accommodate various board sizes/thicknesses/shapes. The clamps can also rotate a full 360 degrees, and remain stable in any position. This ability to manipulate the position of the board is crucial for precision and accuracy. Most PCB clamps have rubber feet which makes it stay firmly in place, some also have bolt-on feet that can mount to the surface. 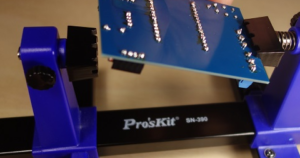 Holding a PCB in one hand and a soldering iron in another hand and trying to get accurate results isn’t exactly easy, so you can see why these devices come in handy for quite a variety of tasks.